Congratulations to our Client Gracewear Collection for their feature in Fab Five Lifestyle Magazine. 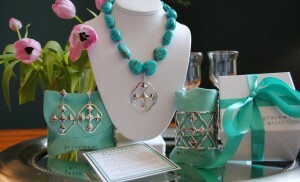 The Gracewear Collection inspires to celebrate the love and faithfulness of God by creating a Christian lifestyle brand of jewelry, clothing, and accessories that represents covering women daily in God’s protection, mercy, and grace.Â The signature design for Gracewear is the Shield of Faith, Â based on Ephesians 6: 10-18. Gorgeous finds under $50 include many gold and rhodium plated pieces with the signature Shield of Faith design. Gracewear is currently featured in over 400 retail shops in the U.S.Â In May 2011, they opened a boutique location in their hometown of Cashiers, N.C. Check them out at GracewearCollection.com!